And all those different types and cuts of meat ­ they’re quite confusing. There’s ground round, ground chuck, ground sirloin; which do you choose? The less fat (especially the “bad” saturated fat) in a piece of meat, the healthier it is said to be (although recently we’ve been learning about other issues with beef, specifically L-Carnitine, a nutrient in red meat that has been linked to heart disease). In addition, there’s the question of calories. For instance, extra-lean ground beef (96 percent lean) has 195 calories for 6 ounces, while 85 percent lean ground beef has 360 calories, and 80 percent lean has 435 calories. And keep in mind, your home-barbecued #burgers are usually much bigger than 6 ounces ­ plus many people typically eat more than one. So why not just go with the lowest-calorie meat? The problem is, leaner meats tend to dry out more during cooking and have less flavor. But it doesn’t have to be like that. -Use less meat and give your burger additional texture and flavor by mixing the meat with finely chopped mushrooms, peppers and onions. You’ll have the same size burger, but it will be lower in calories ­ and you’ll also be getting the health benefits of all those vegetables. -Mix the meat with egg whites (two per pound), whole-wheat bread crumbs, water, salt, pepper and onion and garlic powder. – Add herbs and spices. To make leaner cuts of meat tastier, try a blend of fresh herbs (such as thyme, marjoram, chives and parsley) or dry ground spices (black pepper, smoked paprika, cumin and cayenne), says John Greeley, executive chef at the famed 21 Club in New York City. Herbs and spices add a lot of taste with practically no calories. Whether you use fresh or dried herbs, always crush them first to release their full aroma. -Marinate your meat overnight in something like Lawry’s Herb & Garlic Marinade, which has only 30 calories for 3 tablespoons. -Use cooking spray instead of oil. Spray the burger itself (NEVER spray on an open flame, which is very dangerous) so it doesn’t stick to the grill or pan. To compensate for the lower fat content of the beef, add 1 to 2 tablespoons of defatted broth, water, juice or wine to the pan. -Style matters. According to Paul Gayler, executive chef at The Lanesborough Hotel London and author of The Gourmet Burger (Gibbs Smith, 2005): “Meat should be coarsely ground. If it’s too finely ground, the burger is more likely to fall apart, and the texture will be less satisfying.” Also, keep the meat loose. Burgers will be less juicy if you over-pack the patties. Good burgers should be about an inch thick and have a slightly thinner center. -Once burgers are shaped, chill them again to firm up the meat before cooking, recommends Gayler. -Burgers are best cooked over medium-high heat. -Don’t press down on the burger with the spatula while cooking (or at all). It drains out all the juice and dries out the burger. Also, make sure you cook burgers slowly so they don’t dry out. 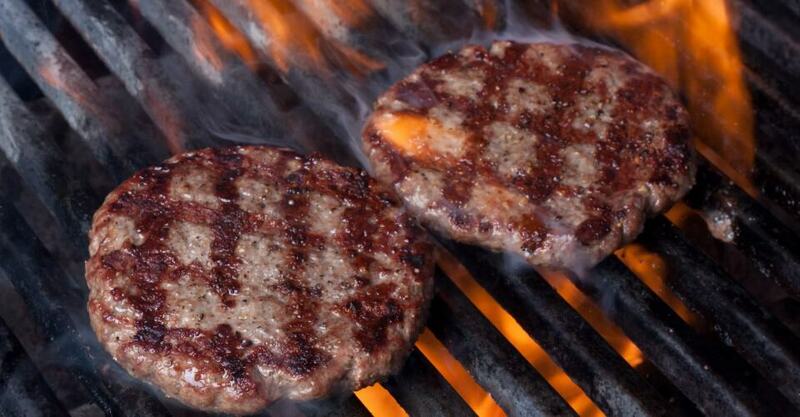 -When it comes to buying your burger meat, try to go with organic, grass-fed beef. It matters for quality and health. Go to eatwild.com or Greenchoices.com to see what all those beef labels mean ( http://www.greenerchoices.org/eco-labels/reportProductArea.cfm?productArea=Beef&mode=view ), or read what The New York Times has to say about grass-fed beef ( http://well.blogs.nytimes.com/2010/03/11/switching-to-grass-fed-beef/ ). One caveat, make sure to still look at the percentage of fat (e.g., 95 percent lean), and choose the leanest available. ­ you still have to make smart choices. -Pork burgers: Try to find lean ground pork loin (10 percent or less fat), which has approximately 240 calories for 6 ounces. However, if you get regular ground pork (20 percent or more fat), watch out: You’re looking at 450 calories. – Vegetable burgers: They’re lower in calories and fat than any other choice. For example, a Boca Burger has only 80 calories. Also you can try a Trader Joe’s or Tandoor Chef Masala Burger (a vegetable burger with spices) for about 120 calories per patty. – Bison burgers: They offer some savings in terms of calories and fat compared with traditional beef burgers. A 4-ounce TenderBison Bison Burger (frozen) has 220 calories and 11 grams of fat (5 saturated). Buns can add anywhere from 110 to 180 calories. A regular 1.5-ounce white hamburger bun has about 110 calories, but kaiser rolls are normally higher at 180 calories. For more fiber, try to get 100 percent whole-grain buns ­ but just because the package says wheat doesn’t mean it’s 100 percent whole grain. Make sure “whole grains” is the first ingredient. Instead of cheese (70 to 120 calories per deli slice ­ plus cheese is high in saturated fat), add lettuce, tomatoes, onions, pickles or even celery to your burgers. Or try “lite” or reduced-fat cheese. Fat-free single-serving slices have about 30 calories each. Also, look for cheeses that are not reduced fat but are thinly sliced (they’re typically less than an ounce with only about 40 to 60 calories per slice). For great flavor and virtually no extra calories, top your burger with tomatoes marinated in red wine vinegar, fresh basil, a drop of olive oil, salt and cracked black pepper. And add some pickled red onions or pickled peppers, says Greeley. Avoid mayo (100 calories per tablespoon) and stick to ketchup, mustard or even steak sauce. At 30 calories per tablespoon, barbecue sauce has twice as many calories as ketchup or steak sauce (15 calories). Those extra calories can add up fast if you’re not paying attention. If you dump 1/2 cup of barbecue sauce on your burger and fries, well, you’ve just eaten 240 extra calories. – Prevent cross-contamination ­ that is, don’t let raw meat, fish or poultry touch foods that won’t be cooked, such as lettuce. Never use the same knife or cutting board without washing it first. – Cook foods to the proper internal temperature (160 degrees Fahrenheit for ground meats and pork; 170 for poultry breasts; 165 for leftovers, casseroles and ground poultry). – Wash your hands with soap and warm water for 20 seconds after handling raw meat or poultry.